Wow. I can’t believe my last blog post was seven months ago! I’ve thought about blogging so many times over the past year, but I just couldn’t seem to make it happen. This weekend marks the one-year anniversary of my father’s death, and despite my best intentions, the only thing I could manage this past year was to withdraw completely. All I wanted was to be with my mother and my family, seeking as much stillness as I could find. It’s been an important part of healing my broken heart, but as this year comes to an end, I finally feel like I’m coming back to life and am excited to once again share my blog with all of you. 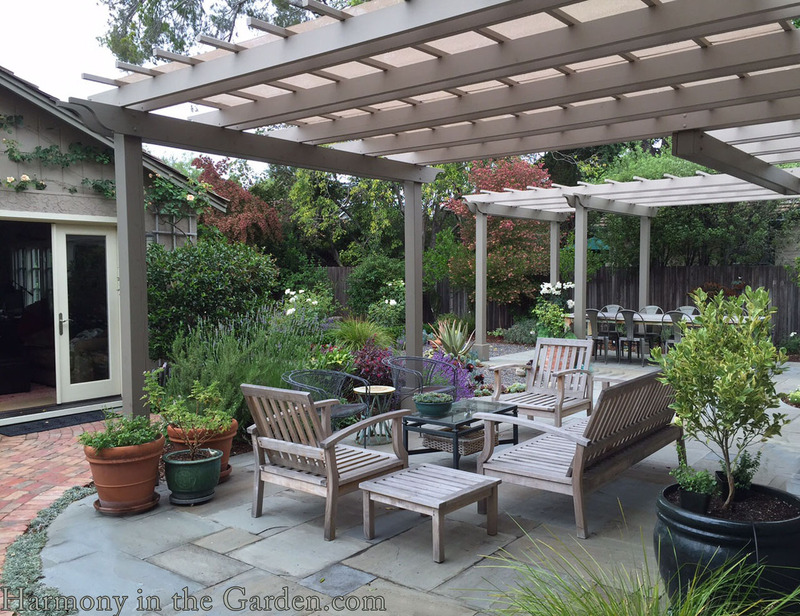 Over the next several months I have lots of gardens to talk about, some belong to my clients, others are near my new home in Granite Bay, some from around the country, and a few surprises I’ll share with you later. So as we enter into another cold and wintery weekend, I thought you might like to nestle in, make yourself a cup of tea, and gather a little inspiration from one of my favorite recent projects. This is the garden of one of my best friends and is one that I’ve wanted to get my hands on for years. Sure, we’ve had some amazing memories with various birthday and girl scout pool parties, but once the kids flew the coop, the pool sat there year after year with very little use. After years of going back and forth regarding keeping the pool or removing it, a decision was made – remove the pool! But in the end, it’s so worth the headaches. Here’s what to expect if you’re thinking of taking out your pool – lots of loud equipment trampling your existing garden, digging for days and days, and a mess like you’ve never seen. But trust me – it’ll end soon enough! Since the family was pretty nervous about the decision to remove the pool, it was critical that I design their new garden with elements that would help create a whole new batch of family memories. We gave this space a facelift by creating a spacious Connecticut bluestone dining area to accommodate lots of impromptu entertaining. Surrounding the new patio is a low retaining wall which will double as extra seating when needed. Bordering the patio is the focal point of the garden – a stunning fountain converted from a jar from Eye of the Day Design Center. Surrounding the fountain is a mix of lemon thyme, dwarf lavender, and blue fescue grass. Instead of lawn or bark chips as a groundcover, we decided to use small, smooth La Paz pebbles, adding a wonderful feel and sound when walked on. It’s a relatively simple process to convert almost any type of container into a fountain. Click here to see another example, as well as find information on how to do this. Near the fountain are lounges for the sunbathers in the family, as well as a pair of heated Galanter & Jones chairs. Yes, heated! I can’t emphasize enough how incredibly comfy and cozy these chairs are when there’s a chill in the air – my favorite chairs ever. Each year, her husband loves growing tomatoes from seed, so he wanted a space where he can continue to grow them, along with other crops of beans, peppers, and even corn. The garden is small, but we were able to create a space at the very end that would have enough sun for his vegetable beds, complete with a see-through fence to keep out their rambunctious puppy. Next to the fenced vegetable garden are two stacked-stone raised beds designated for cutting flowers and herbs. These raised beds not only provide plenty of bouquets for the house but also protect the plants from marauding puppies! Over the next few months I’ll be posting more before-and-afters, so stay tuned for lots of inspiration! Oh, and for those of you attending the Northwest Flower and Garden Show next month, I hope to see you there! I’ll be speaking on Feb. 20th and 21st, as well as competing in a fun, live event called ‘Container Wars’! Welcome back and thanks for the beautiful and inspiring post. I will add that our front yard is looking very good as it grows up. The olive trees will have their first shaping at the end of this month! was full of wonderful memories. Your use of the pool space is creative and appealing. Thanks for sharing. Welcome back! I’ve missed your posts. Dearest Rebecca, so good to have you writing again. Fabulous makeover on the “no more pool” garden! Look forward to more wonderful stories from you! So nice to “hear” your voice again, Rebecca. I’m sorry for your loss and sadness. I am planning to see you at the Garden Show in Seattle on Feb. 20th. I’d also love to host you on Bainbridge if you have time…Bloedel Reserve? Hugs to you. I truly enjoy your talent. Welcome back, Rebecca. Your thoughtful words and beautifully sensitive garden style has been missed, but understood. The transformation of this space from a large pool play area to a different kind of family relaxation area is perfect. The raised stone planters are not only great to look at but a brilliant design with pups racing and chasing! The dogs don’t get into trouble and the family gets to enjoy their new family space plus their new gardens! It’s a winner! Thank you, Sheila, I really appreciate your comments. You really ‘get’ this garden (no surprise, being a dog lover!) I hope you’ve settled into your new life and are loving it? I was thinking of your beautiful garden in Denver the other day and wonder how the new homeowners are enjoying it – I bet they love it. We had such a fun time, didn’t we? Sending you lots of love. I was wondering why there were no blogs so was pleasantly surprised when this popped up! My sympathy on the loss of your father, and glad you were close to your Mother. The garden redo was very inspirational, well done, and glad you are back. Thank you, Susan, it’s so nice to be back! What a transformation! So beautiful. Welcome back. The garden is lovely but sorry you took out the pool…especially with a Lab puppy…there is nothing they love more than water of any kind. I know, I have two. Yes, the puppy would’ve loved the pool for sure. He came a year after the installation, though, otherwise they might not have taken it out! The ‘something for everyone’ theme is perfectly expressed in this new garden – wonderful! And the puppy has stolen my heart. Thank you, Stacy – glad you enjoyed it! Very pretty! Thank you for the inspiration! You’re very welcome, Patty. Have a beautiful weekend! Thank you, Christina – you’re so right. This year has been the toughest one of my life, for sure, but finally having the energy again to blog and to garden is a sign that life continues to move forward (with or without you, right?) I hope all is well with you and your new life in LA! Welcome back Rebecca! I’m so glad that you took the time to heal your heart and soul. The color in the two stacked-stone raised beds is gorgeous! Looking forward to your “DON’T SNUB THE SHRUB!” presentation on the 20th! Thank you, Rachel, I’m so glad you enjoyed it and please stop by and say ‘hi’ – it’ll be good to see you! Beautifully done, Rebecca! Your father would be proud. Sorry I’ll miss you at the NWFGS, but I look forward to future posts! Beautiful and functional. So good to have you back. Thank you, Linda, I appreciate it. Beautiful! So nice to have you back! It’s so nice to be back, Donna – thank you! Absolutely beautiful Rebecca! I would never have guessed there was a pool there. Sending (((hugs))) your way. Awww, thank you Lynn – I’m glad you enjoyed it. Stay dry this weekend!